yes he is, but this picture, with the steggie bumps squished under the helmet, doesn't nearly do it justice. more pics to come soon, but this was taken at the children's festival this past weekend and EVERYONE loved his hat from aunt liz!!!!! Darling! He looks super pleased. You've got to admit though, he looks good in the riding helmet too! look at that FACE! !pure delight! How fun! 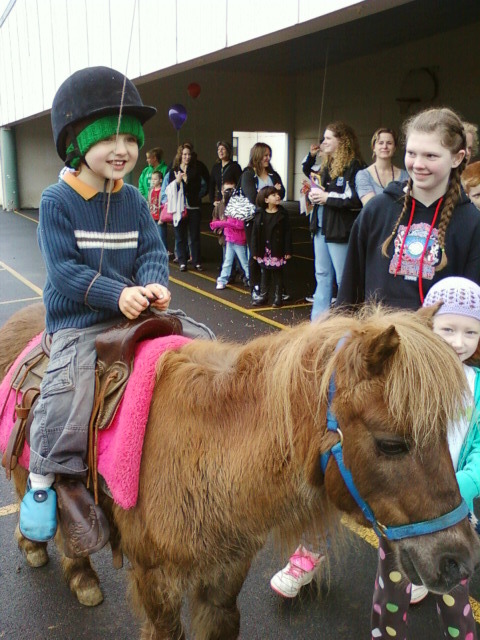 Michael had his first pony ride last fall. He loved it. I'm noticing his shoes…I really like soft-soled leather shoes for Michael, but worry that they would be too slippery/get too wet in the winter. What's your experience? Are they water-proofed? lisa- these are the soft star in the style "rambler". the leather is water resistant, and it has a rubber sole with some minor tread. he hasn't had any trouble slipping. he wore through the leather-only soles so fast, and they didn't hold up as well with the non-stop wear that we put on them in the oregon winter, so we tried this style and i've been very pleased, they've held up great. I didn't know that! Cool. I'm going to look into those. They could be just what I'm looking for.